It turns out the Nike Kobe 9 isn&apos;t indestructible, after all. They don&apos;t call it "Rip City" for nothing, as Portland&apos;s Wesley Matthews blew out his Kobe 9 Elite PE during the Trail Blazers game with the Eastern Conference-leading Atlanta Hawks. This is coming from the same guy that wore a pair of the Kobe 9 EXT KRM "Challenge Red" on court to actually play in, so we&apos;re a little surprised this happened to this pair and not the leather ones. We&apos;ve seen this happen before to Jordan shoes, you may remember Nick Young earlier this season or Tony Wrotten last year, but this is the first time we&apos;ve seen this happen to the performance marvel that is the Kobe 9. For those of you wondering, Matthews chipped in 19 points in 33 minutes, which is apparently enough action to blow right through the soles. Maybe it is time to move on to the Kobe X. 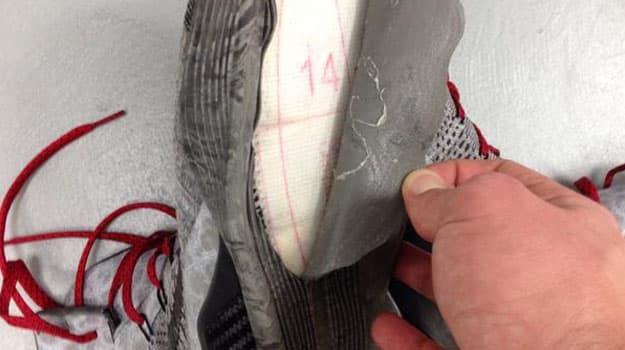 Check out Wesley Matthews&apos; blown out Kobe 9 below courtesy of the Blazers equipment staff and keep it with Sneaker Report for all your NBA sneaker news. RELATED: Is This the Best Nike Kobe 9 Elite PE Yet?